Place eggs and milk in temp-tations® 16-ounce mug. Whisk with a fork. Add a pinch of salt and pepper to taste, and whisk again. Add in cheddar cheese and stir. 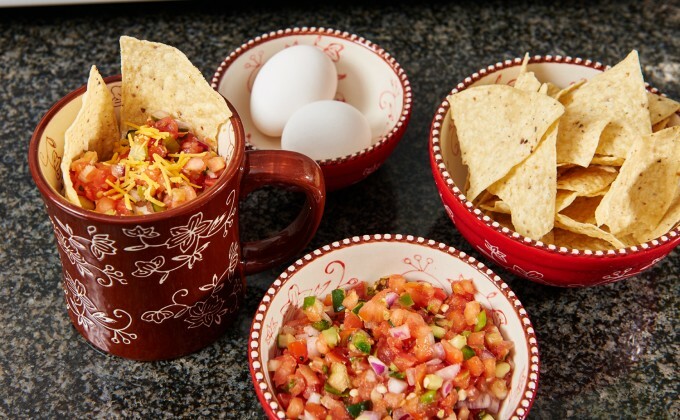 Crumble up 8 tortilla chips in your hands and add to mug. Stir until all chips are coated with egg mixture. Top with salsa and microwave for 4 minutes or until egg is fully cooked. Garnish with remaining two tortilla chips, more salsa and other toppings if desired.